Dec/19: 499 euros. Free upgrade to superior room! Dec/19: 342 euros. Free upgrade to superior room! Dec/19: 216 euros. Free upgrade to superior room! 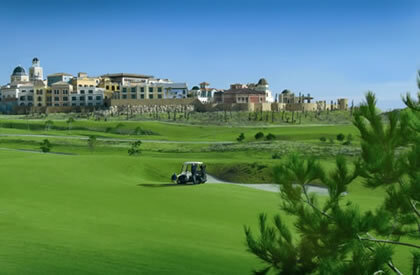 The Melia Villaitana complex is designed as a Mediterranean village located within 2 golf courses, and consists of approximately 25 individual buildings, situated on a hill with a wonderful view toward Great Benidorm Bay. At Melia Villaitana, you'll find a world of relaxation and a new concept of luxury on the Costa Blanca. Melia Villaitana is located in a privileged environment of more than 1.6 million square metres off the mountains Finestrat and the Mediterranean Sea and Benidorm background. Melia Villaitana offers a variety of interesting activities to get all kinds of customers who may play one of their two 18 hole golf courses, which bear the unmistakable stamp of Nicklaus Design. There are pools with a surface of 5000 m2, tennis and paddle tennis courts, à la carte restaurant, Buffet Restaurant, Restaurant Tasca Spanish, Eastern Restaurant, Barbecue, Bar, Pool Bar, Mini club (for children 4 to 12 years-under), artificial beach, 5 pools, Tennis and Paddle, Gym, Internet - free WiFi onesz, Business Centre, Hall massages and treatments, exterior and interior parking. Guest Room: The 104 cosy Meliá rooms provide a king size bed or twin beds, fully equipped bathroom, minibar, telephone, satellite TV, WiFi, safe and balcony. They measure approximately 28m2 with 6m2of terrace. Deluxe Rooms: The hotel provides 101 Deluxe rooms with a Mediterranean style creating a most relaxing ambience. The rooms have a king size bed or twin beds, fully equipped bathroom, minibar, telephone, satellite TV, WiFi, safe and balcony. They measure approximately 33m2 with 8m2 of terrace. Premium Rooms: The 26 Premium rooms are located on the 3rd and 4th floors and provide a relaxing environment decorated with light coloured fabrics and furniture. The rooms provide a king size bed or twin beds, fully equipped bathroom, dressing room, minibar, telephone, satellite TV, WiFi, safe and balcony. They measure approximately 40m2 with 8m2of terrace. Junior Suites: The 79 Junior Suites at the Meliá Villaitana are equipped with twin beds or a double king size bed, along with a spacious and elegant separate lounge with a dining table, chairs, sideboard and sofa-bed. They measure approximately 42m2 with 8m2of terrace. Premium The Level Guestroom: The 69 The Level Premium rooms transmit peace and light, decorated with light coloured fabrics and furniture. The rooms have a king size bed or twin beds, fully equipped bathroom, dressing room, minibar, telephone, satellite TV, WiFi, safe and balcony. They measure approximately 42m2 with 8m2of terrace. Junior Suite The Level: The hotel provides 13 The Level Junior Suites decorated in warm tones with traditional Spanish furniture and providing a bedroom with a king size bed or twin beds, fully equipped bathroom, spacious dressing room, minibar, telephone, satellite TV, WiFi, safe and balcony. In the main room, besides the bed there is also a lounge area with a divan, armchair and pouffes. They measure approximately 42m2 with 8m2of terrace. Grand Suite The Level: Our 12 fabulous The Level Grand Suites are characterised by their Mediterranean style decor and their separate lounge and spacious living area. The suites have a bedroom with a king size bed or twin beds, fully equipped bathroom, spacious dressing room, minibar, telephone, satellite TV, WiFi, safe and balcony. They measure approximately 55m2 with up to 30m2of terrace. Penthouse Suite The Level: 2 exclusive The Level Penthouse Suites. Situated in a prime location these rooms are unique for their views and for their Jacuzzi bath with wonderful outdoor views. The rooms have a large bedroom with a king size bed, separate lounge, fully equipped bathroom, outdoor Jacuzzi, spacious dressing room, minibar, telephone, satellite TV, WiFi, safe and balcony. They measure approximately 60m2 with up to 40m2of terrace. Royal Suite The Level: 2 suites located in the same building next to The Level lagoon-style pool and overlooking the golf courses. Spacious rooms in an idyllic location. The rooms have 2 large bedrooms with a king size bed and two single beds, with a large separate lounge, 2 fully equipped bathrooms, 2 large dressing rooms, minibar, telephone, satellite TV, WiFi, safe and balcony. They measure approximately 220m2 with 2 terraces measuring up to 50m2. Presidential Suite The Level: Our splendid The Level Presidential Suite has exquisite decoration and exclusivity, transmitting a serene and sophisticated atmosphere through the predominance of light tones, luxurious fabrics and warm lighting which invites relaxation. The suite has a bedroom with king size bed, large separate dining room, fully equipped bathroom, outdoor Jacuzzi on its terrace with stunning views, spacious dressing room, minibar, telephone, satellite TV, WiFi, safe and balcony. They measure approximately 150m2 and up to 200m2of terrace.